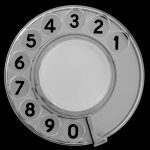 In an era of smart phones, social media and instant messaging apps, is there still a place for the traditional phone number? It sounds like a daft question, but it is actually very relevant to today’s communications. The way people are phoning has changed since the Post Office set up the phone system in the UK in 1912. The system for area codes was set up in the 50’s. Quite a lot has changed since then! Trilby hats are no longer fashionable, and neither are Teddy Boys. It’s no wonder that the way we use our phones has changed. In 1969, the mobile was undreamed of. Neil Armstrong had famously landed on the Moon using less powerful computers than we now have in a watch. Now we have watches that synch automatically with your smartphone. You can speak to a small box and have it order your shopping, or play music. The traditional phone number has fallen a bit behind. Set up in the fifties, it is designed to identify the geographic location of the number, and reach an individual or company. You may not realise that your area code for your landline may contain a location identifier. The second and third digits often match the first and second letters of the town or city (for instance, for Aberdeen, the area code 01224 contains ‘2’ and ‘2’ as the second and third digits, corresponding to ‘A’ and ‘B’ on the alphanumeric phone keypad). But changes in technology mean that such geographic identifiers are unnecessary. In fact, many younger people no longer what an area code or what it is for. It is becoming unnecessary to even dial numbers, as our smart phones now serve as a contact directory, storing numbers we need and dialling with a single click. The changes are set to continue. BT is discussing moving the whole phone system in the UK from wires to the internet. This will effectively change the requirements for the UK numbering system. As you will probably know (as you are reading our blog), it is becoming increasingly common for calls to be made and received using the internet just now, as more and more people adopt VoIP.